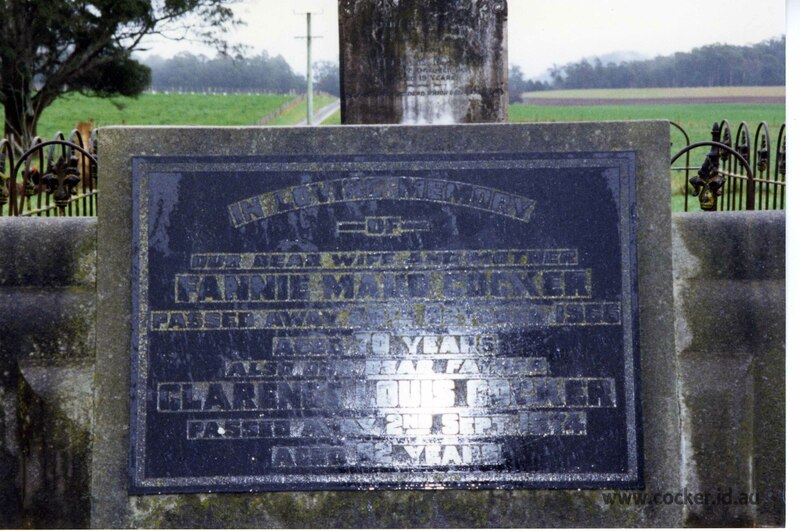 Clarence Louis (Trick) Cocker was born on 20 Dec 1891 in Mersey, Devonport and died on 2 Sep 1974 in Lower Barrington, Tasmania at age 82. Clarence married Frances Maud(Fannie) Reeves, daughter of Thomas Reeves and Ellen Lethborg, on 18 Jun 1919 in Lower Barrington, Tasmania. Frances was born on 23 Sep 1896 in Barrington, Tasmania and died on 20 Oct 1966 in Lower Barrington, Tasmania at age 70. A wedding in which a considerable amount of interest was evinced was celebrated in the Baptist Church Lower Barrington, on the evening of June 18. The Rev. W Heaven was the officiating minister, and the pretty little bridal party stood under an archway, a wedding bell, with the initials F.R. and C. C. on either side. The contracting parties were Frances Maud, fourth daughter of Mr. and Mrs. Thomas Reeves, and Clarence Lewis, youngest son of Mr. and Mrs. J. Cocker of "Bellevue". The bride, who was given away by her father, wore a handsome dress of white silk crepe cloth, the draped skirt being daintily relieved with pink. The bodice had a white net front. showing touches of pink, as did the sailor collar, outlined with tiny pink beads. A white satin sash, with bow, and the usual bridal veil, sure mounted by a spray of orange blossom and another spray tucked into the waistband, completed a very pretty, costume. The bride carried a sheaf of white chrysanthemums and asparagus fern. There were two bridesmaids- Miss Ruby Reeves (the bride's sister), Miss Minna Cocker (the bridegroom's sister), in white silk. Both wore pale blue silk Egyptian veils, and the bride-groom's gifts, pretty gold brooches, and carried posies of chrysanthemums and ferns. Little Joan Morey (the bridegroom's niece) was maid of honour. She wore a white silk dress, and presented by Mrs. A. Mather (Devonport). Mr. Leslie Reeves was best man and Mr. W. Scott groomsman. As the bride entered the church Miss Scott left the church . Miss Watt played the "Wedding March". On leaving the church the young couple were greeted with a perfect storm of rice and confetti. Several telegrams of congratulation were received, and the happy pair were the recipients of numerous wedding gifts, among them several handsome cheques. Later in the evening Mr. and Mrs. C. L. Cocker motored to Ulverstone on the first stage of their honeymoon. Mrs. Cocker travelled in a grey tagel hat, swathed with gold powdered tulle, and a handsome grey travelling coat, the bridegroom's gift. The bride's gift to the bridegroom was a travelling rug. Bruce was born on 10 Sep 1936 and attended Barrington School then Sheffield Area School. He took over his parents (Trick & Fanny) farm, Belle Vue, at Lower Barrington in 1964. Belle Vue was subdivided so that Bruce and his parents were able to live in the house while Bruce continued to farm the remainder of the (subdivided) property. He milked cows until he retired and sold the farm in 1978. He sold it to Vern & Dianne Reeves family, who are related via his mother Fanny. 4-Frances Elaine Cocker was born on 29 Oct 1920 in Nurse Leigh's, Shorewell, Devonport and died in Apr 2001 at age 80. 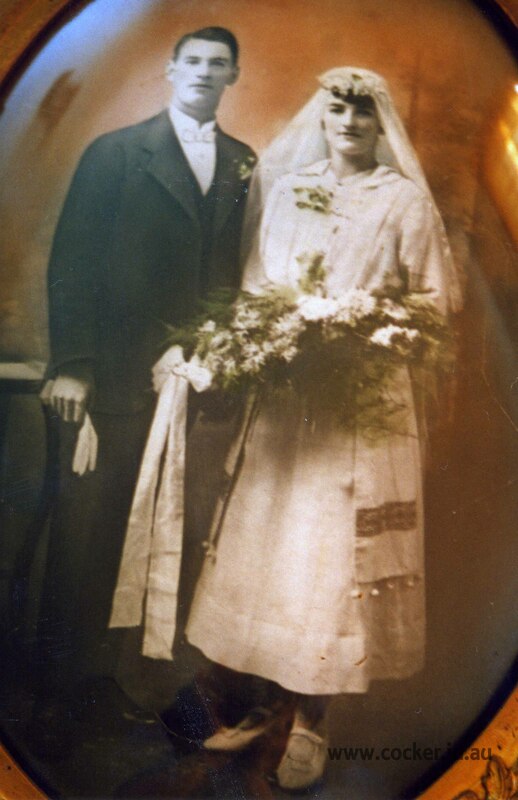 Frances married Eustace William Page, son of Ernest William Page and Ida Christina Eeles, on 30 Mar 1940 in Methodist Church Ulverstone. Eustace was born on 24 Apr 1916 in West Devonport, Tasmania, died in 1993 at age 77, and was buried in Mersey Vale Cemetery. They had three children: Elaine Elizabeth, Denis Rowan and Jill Frances. 5-Elaine Elizabeth Page was born on 2 Oct 1940. Elaine married John Nicholson on 5 Jan 1962. John died on 22 Jan 2007. They had two children: Michelle Elizabeth and Susan Maree. 6-Michelle Elizabeth Nicholson was born on 5 Apr 1965. Michelle married Clinton Boyes on 18 Mar 2000. Clinton was born on 31 Aug 1964. They had two children: Dylan John and Tahli Paize. 7-Dylan John Boyes was born on 1 Jun 2003. 7-Tahli Paize Boyes was born on 1 Jun 2003. 6-Susan Maree Nicholson was born on 29 May 1966. Susan married Robert Rose on 21 Mar 1991. Robert was born on 21 Nov 1965. They had three children: Ebony Jade, Ella Grace and Lillie Mae. 7-Ebony Jade Rose was born on 8 Oct 1991. 7-Ella Grace Rose was born on 21 Jan 1997. 7-Lillie Mae Rose was born on 11 Oct 1999. 5-Denis Rowan Page was born on 17 Jan 1947. Denis married Heather Christina Leslie on 14 Feb 1970. Heather was born on 31 Mar 1950. They had three children: Rowan Kenneth, Julie Anne Christina and Tanya Louise. 6-Rowan Kenneth Page was born on 20 Sep 1973. Rowan married Tania Maree Sheen on 25 Jan 2003. Tania was born on 21 May 1976. They had one daughter: Lauren Christina. 7-Lauren Christina Page was born on 28 Apr 2006. 6-Julie Anne Christina Page was born on 16 Jul 1975. Julie married Mathew Peter Kelly on 20 Jul 2002. Mathew was born on 12 Nov 1973. They had two children: Olivier Jade and Emily Sienna. 7-Olivier Jade Kelly was born on 12 Sep 2001. 7-Emily Sienna Kelly was born on 2 Dec 2004. 6-Tanya Louise Page was born on 16 Feb 1977. Tanya married Sion Terron Reid. Sion was born on 23 Nov 1976. 5-Jill Frances Page was born on 18 Mar 1954. Jill married John Sharman, son of Keith Sharman and H Garwood, on 6 Jan 1974. They had two children: Anita Lynette and Lisa Ann. 6-Anita Lynette Sharman was born on 23 Aug 1975. 6-Lisa Ann Sharman was born on 20 Aug 1979. 4-Clarice Rebecca Cocker was born on 6 Jun 1926 in Belle Vue, Lower Barrington. 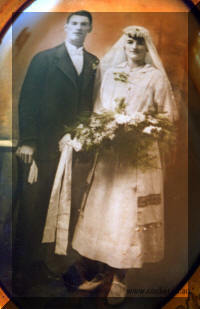 Clarice married Harold John Lockwood on 28 May 1951 in Baptist Church, Ulverstone, Tasmania. Harold was born on 22 Aug 1922, died on 3 Sep 1993 at age 71, and was buried in West Kentish, Tasmania. Another name for Harold was Jack. They had four children: Jan Patricia, Sally Maree, Christine and John Grant. 5-Jan Patricia Lockwood was born on 20 Dec 1951. Jan married Wally D. Crosswell. Wally was born on 16 Nov 1945. They had five children: Angela Jan, Sally Anne, Julia Louise, Dionne Rebecca and David Wallace. 6-Angela Jan Crosswell was born on 18 Jun 1976. Angela married Andrew Barton Chant. Andrew was born on 22 Sep 1972 in Bendigo, Victoria. They had two children: Natalie Rebecca and James Anthony. 7-Natalie Rebecca Chant was born on 9 May 2006 in Albury, New South Wales. 7-James Anthony Chant was born on 28 Apr 2009 in Albury, New South Wales. 6-Sally Anne Crosswell was born on 27 Sep 1977. 6-Julia Louise Crosswell was born on 21 Dec 1978. 6-Dionne Rebecca Crosswell was born on 21 Dec 1979. 6-David Wallace Crosswell was born on 21 Apr 1988. 5-Sally Maree Lockwood was born on 30 Jul 1953. Sally married Brian J. Williams. Brian was born on 4 Nov 1953. They had three children: Michael Lewis, Robert John and Amy Catherine. 6-Michael Lewis Williams was born on 8 Aug 1982. 6-Robert John Williams was born on 19 Jun 1985. 6-Amy Catherine Williams was born on 29 Dec 1989. 5-Christine Lockwood was born on 9 Jul 1956. Christine married Rodney V Johns. Rodney was born on 2 Aug 1954. They had three children: Timothy, Shane Anthony and Carly Michelle. 6-Timothy Johns was born on 7 Feb 1979. 6-Shane Anthony Johns was born on 26 Jan 1981. 6-Carly Michelle Johns was born on 25 Jan 1983. 5-John Grant Lockwood was born on 23 Feb 1964. John married Ann Lasala. Ann was born on 29 Mar 1965. They had two children: Roland John and Bianca Victoria. 6-Roland John Lockwood was born on 11 Oct 2001. 6-Bianca Victoria Lockwood was born on 27 Jul 2004. 4-Lewis Dean (Blue) Cocker was born on 13 Feb 1932 in Belle Vue, Lower Barrington, died on 16 Jun 2006 in Barrington, Tasmania at age 74, and was buried in Ashes at Mersey Chapel Gardens, Tasmania. Lewis married Beverley Mary Sheean about Jun 1953 in Catholic Church, Latrobe, Tasmania. Beverley was born on 21 Apr 1934. They had three children: Stephen Michael, Christopher Dean and Narelle Sheree. 5-Stephen Michael Cocker. Stephen married Sue Harrison. 5-Christopher Dean Cocker was born on 21 Sep 1953 and died on 6 Aug 2003 in Devonport at age 49. Christopher married Pamela Elizabeth Bissett about 1995. They had two children: Leonie Maree and Jason Charles. 6-Leonie Maree Cocker was born in 1973. Leonie married Peter Neville Tuson on 28 Oct 1996 in Devonport. They had two children: Liam Peter and Aaron Dean. 7-Liam Peter Tuson was born on 15 May 1995 in Latrobe. 7-Aaron Dean Tuson was born on 15 Apr 1998 and died on 14 May 1998. 6-Jason Charles Cocker was born on 28 Jan 1976 in Mersey, Devonport. Jason married Tina Coates. They had one daughter: Sophie Joan. 7-Sophie Joan Cocker was born on 24 Jan 2008 in Latrobe. 5-Narelle Sheree Cocker was born on 3 May 1959. Narelle married Warren Alexander on 12 Apr 1986 in Devonport. They had two children: Bonnie Chevon and Candis Louisa. 6-Bonnie Chevon Alexander was born on 21 Oct 1986. 6-Candis Louisa Alexander was born on 23 Sep 1988. 4-Bruce Allen (Plum) Cocker was born on 15 Sep 1936 in Sheffield.